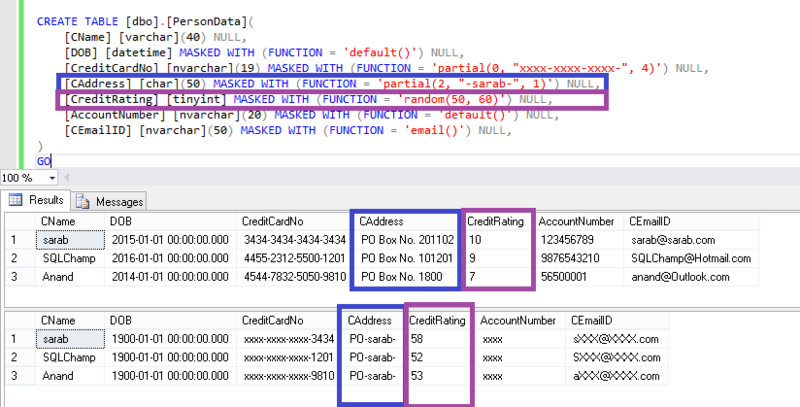 In last few blogs about Dynamic Data Masking we got the basic understanding of the topic & how to configure Dynamic Data Masking using Azure SQL Database portal. In this blog we’ll configure Dynamic Data Masking using T-SQL Scripts on Azure SQL Database. Let’s get some more idea about each one of them. Email: This is simple to understand, this Masking method exposes the first letter of an email address and the constant suffix “.com”, in the form of an email address. Like: aXXX@XXXX.com. Random: This function can be applied on numeric data type columns, this replaces the actual value with a random numeric value within the range provided while configuring this masking. Custom String: Last but not the least is Custom String, this lets you choose your own method to mask the data. You get so many options to choose from like you can specify how many initial and last characters to show to the user and in-between the text can be replaced by any text or a special character. Note: If the original value is too short to complete the entire mask, part of the prefix or suffix will not be exposed. Once you understand the different available data masking functions, it becomes very easy to Configure Dynamic Data Masking using T-SQL. Let’s take an example that we have to create a new table for our Application and we want to configure Dynamic Data Masking, for the purpose of doing this we must add the masking function parameter while defining the table itself. However, it is quite possible to change the column later by using Alter Table command. You can see I choose to show initial 2 characters of CAddress column and given a padding value as “–sarab-” which will replace all rest of the data except last 1 character. For CreditRating column I am using random string function and given a range of 50 to 60. Yes, we were able to successfully Configure Dynamic Data Masking using T-SQL.